At Launch Pad 39A at NASA's Kennedy Space Center in Florida, the STS-135 crew pose for a group portrait in front of space shuttle Atlantis' hatch in the pad's White Room. 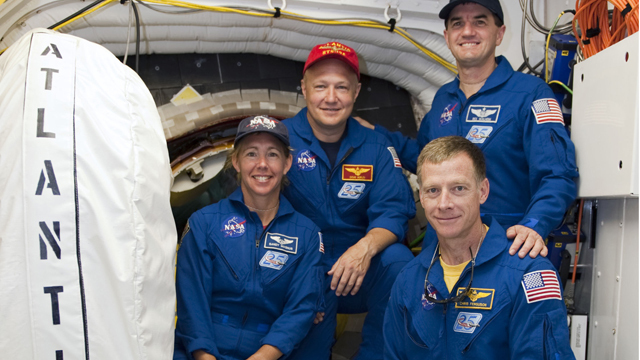 From left are Mission Specialist Sandy Magnus, Pilot Doug Hurley, Mission Specialist Rex Walheim and Commander Chris Ferguson. An access arm supports the White Room that is in place against the shuttle which provides entry to the crew compartment. The astronauts are at Kennedy to participate in a launch countdown dress rehearsal called the Terminal Countdown Demonstration Test (TCDT) and related training. For more than 30 years, America's space shuttles have rocketed into orbit. Columbia, Challenger, Discovery, Atlantis and Endeavour blasted off 134 times from the Kennedy Space Center. They were mankind's first reusable space launch vehicles, and the first to glide back to Earth on wings. As the space shuttle program ends with the final flight of Atlantis, CNN looks back at key moments that have defined this pioneering space program.